Making the big decision to start trying for a baby is exciting, it's life changing too. Not only during pregnancy, but of course once your baby arrives. 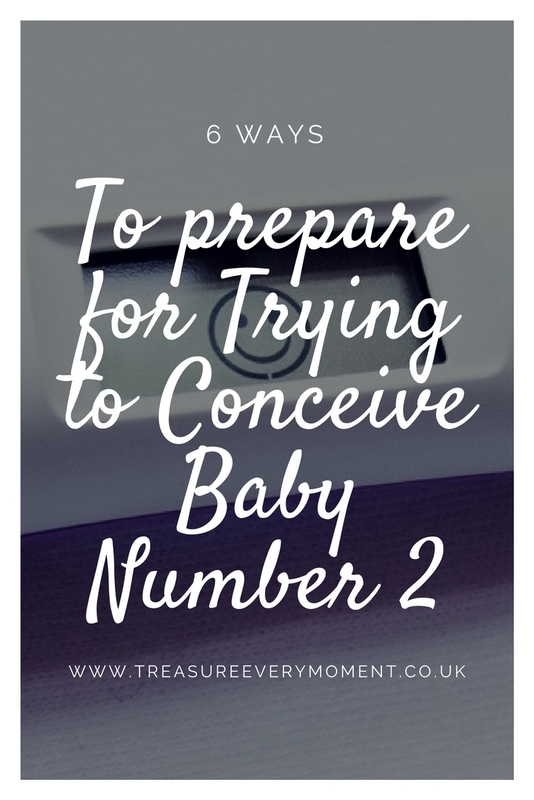 Having been blessed with our first daughter back in 2015 and lucky enough to now being pregnant again I thought I'd share a few ways to prepare for trying for a baby. 1) Eat the foods you love but can't eat while pregnant - Being pregnant the first time around was an exciting unknown adventure, second time around you're fully aware of what it's like to be pregnant. At the start of my last pregnancy I loved saying I couldn't eat certain things, it made my pregnancy seem a lot more real before there was a bump to be seen. However after the 6 month mark all I wanted was a jacket potato with coleslaw and a Mr Whippy ice-cream...it became torture. Of course I was more than happy to not eat these foods with the focus of my baby's health at the forefront of my mind, but it didn't stop me craving them massively. (I know I was particularly strict with the foods I wouldn't eat while being pregnant, it helped to relieve the constant worry slightly because it was something I could control). Prior to trying to conceive baby number two eat all the foods you love but won't be able to eat for 9 months, such as soft scrambled eggs, Mr Whippy ice-creams, coleslaw, potato salad, soft boiled eggs, alcohol, soft cheeses etc. For further guidance on foods to avoid while pregnant see here. 2) Start taking folic acid - Some people recommend you start taking folic acid around 3 months before you're going to start trying to conceive and then 3 months into your pregnancy (see NHS guidance here). By starting earlier rather than later it just becomes routine to take one each day and won't be forgotten if you do get pregnant. 3) Clear the calendar - If you were anything like me during pregnancy from around the 7 week mark I was no fun to be around. Days were filled with feeling sick, sorry for myself and generally so tired. Now I'm aware that you can't spend days lounging around on the sofa or in bed when you have another child, so by keeping your diary as free as possible between around 7-15 weeks from each month you try to conceive will help to relieve the pressure of being social. 4) Get any home renovations completed - Life with two children will be twice as busy as life with one, so what better time to tackle the never ending to-do list of big or little jobs that need doing around the house? We wanted to get a downstairs toilet put in, in readiness for toilet training Isabella, as well as getting her 'big girl' bedroom decorated. The idea of having these done with a little baby and toddler in the house is enough to make us get on with it! 5) Make sure you're up to date with smear tests (now known as cervical screening) - You can't have a smear test done while you're pregnant (or at least that's what I was told), so it's worth ensuring you're up to date with them. I was due my first one when I was pregnant with Isabella and therefore couldn't have it. Months passed after giving birth as I was scared it was going to hurt. Finally about a year after giving birth I plucked up the courage to get a smear test done and it was honestly nothing to worry about. It was over in seconds, wasn't painful in the slightest and after having a baby I certainly wasn't embarrassed about exposing myself! 6) Mentally prepare yourself - Pregnancy is an absolute blessing, but it is a very harsh process on a woman's body. The first three months are filled with sickness, a sense of smell like no other, food aversions, muscle pains as your body prepares to grow, sore breasts, vivid dreams, more sickness and pure exhaustion. The next three months are filled with a beautiful growing bump, first kicks, glossy hair, less sickness/pain and the reality that you'll be having a baby soon (my favourite trimester for sure). The last three months are filled with an uncomfortably large bump, legs/arms poking into your ribs, not being able to put your own socks on, dropped something on the floor? Forget about being able to pick it up, swollen ankles/hands, never being able to get comfortable, sleepless nights, heart burn etc. Then you have the wonder of labour that is obviously incredibly painful and your deflated post labour body which takes a while to get your head around. The wobbly parts, baby weight, constant worry you're going to wet yourself if you laugh/cough, stretch marks, falling out hair, pain from any surgery you may have had during labour, very little sleep, milk coming in, hormones flying everywhere...it all takes some getting used it. It's worth it when you spend hours staring at your beautiful newborn baby, taking in every little tiny detail in case it disappears in a blink. During the first pregnancy you don't know what to expect, but by your second/third/fourth pregnancy you know the horrors (and wonderful moments) that are to come. I've not decided which is better - bliss with the sudden shock of a first pregnancy or knowing with the chance to prepare of subsequent pregnancies? Some great advice - I think the feeling of wanting is such a struggle in itself that arranging some practical distractions is a good idea to stay sane too! Thanks for another inspiring article, I can relate well to a lot of it. I'm a great believer that your body craves for a reason so try and not be too hard on yourself, the comfort you get from those foods is well deserved and I'm sure your baby won't mind! The NHS does say ice cream is fine after all, so just go with it Mama. I'm also cool with the soft eggs thing, as long as the box has the lion stamp on it the eggs are safe (thank goodness, as I only like mine runny or soft) luckily I'm not a fan of blue cheese so I'm all good there! :) what are your cravings this time round? This is great advice! Try to remove all stresses before the pregnancy and birth, a friend of mine moved house a week before she gave birth, eeeeek, panic!